Update October 7, 2006: Since this Earthfiles and my Coast to Coast AM radio interview with Adam Jimenez on September 22, 2006, the Great Lakes Dive Company website no longer functions on the net and neither Adam Jimenez nor Jim Bessette have returned phone calls or emails as they did prior to September 22. Adam told me that the company under which he and Bessette have operated, Great Lakes Dive Company, would be moving and not be settled until some time in October 2006. Perhaps that explains the communication interruption in website, phone and email. However, James Carrion, MUFON Director, has not been able to confirm that a company doing business as “Great Lakes Dive Company” has ever been registered with the State of Michigan. So far, the Jimenez and Bessette communication with the Canadian government, as Jimenez described, has not been proved or disproved. Security concerns might have provoked Jimenez and Bessette to move out of public access until either a salvage operation or other procedure can establish their claims as legitimate or not. September 22, 2006 Brown City, Michigan – Recently, the Great Lakes Dive Company in Michigan, in the persons of Adam Jimenez and Jim Bessette, announced a discovery of an F-89c on the bottom of Lake Superior. Also, Jimenez asserts that 212 feet from the jet is a mysterious object shaped a bit like a teardrop. Could these underwater finds help answer what happened fifty-three years ago on November 23, 1953, when Michigan’s Kinross AFB launched an F-89 to investigate a rapidly moving UFO? That night, American Air Force radar operators watched the radar blip of the F-89, carrying two men, merge with another radar blip of an unidentified flying object. Back then, the most prominent investigator of government information about UFOs was Major Donald Keyhoe, U. S. Marine Corps, and former Director of the National Investigations Committee on Aerial Phenomena, also known as NICAP. Major Keyhoe wrote five books, beginning in 1950 with The Flying Saucers Are Real – which was published only three years after the famous Roswell disc crash headlines that the government tried to turn into a weather balloon. With full details, that official USAF script then showed how radar operators had picked up the blip of an unknown object over the Soo Locks near Sault Sainte Marie, Michigan. 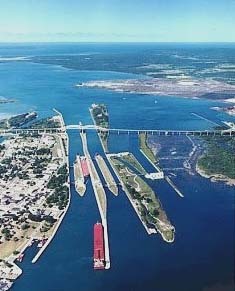 [ Editor’s Note from U. S. Army Corps of Engineers in Detroit, Michigan District: “The world-famous Soo Locks form a passage for deep-draft ships around the rapids in the St. Marys River. Before white men came to the area, the Ojibway Indians who lived nearby portaged their canoes around the ‘Bawating’ (rapids) to reach Lake Superior from the St. Marys River. “In 1797, the Northwest Fur Company constructed a navigation lock 38 feet long on the Canadian side of the river for small boats. This lock remained in use until destroyed in the War of 1812. Freight and boats were again portaged around the rapids. “Congress passed an act in 1852 granting 750,000 acres of public land to the State of Michigan as compensation to the company that would build a lock permitting waterborne commerce between Lake Superior and the other Great Lakes. The Fairbanks Scale Company, which had extensive mining interests, in the upper peninsula, undertook this challenging construction project in 1853. “In spite of adverse conditions, Fairbanks’ aggressive accountant, Charles T. Harvey, completed a system of two locks, in tandem, each 350 feet long, within the 2 year deadline set by the State of Michigan. On May 31, 1855, the locks were turned over to the state and designated as the State Lock. Soo Locks in Sioux Sainte Marie, Michigan, allow sea traffic from the huge Lake Superior to Lake Huron and Lake Michigan. Image courtesy U. S. Army Corps of Engineers. 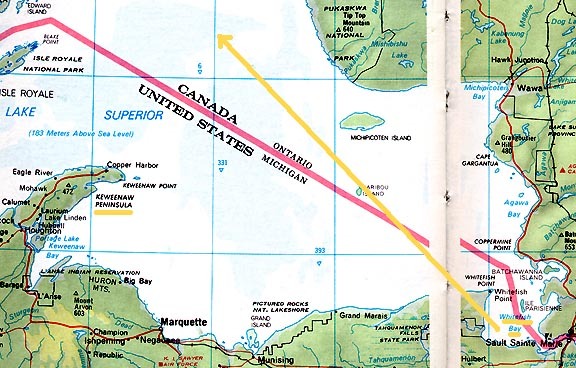 Since Soo Locks was a restricted area, an F-89 jet from Kinross Air Force Base south of Sault Sainte Marie was immediately sent to investigate with a crew of two. 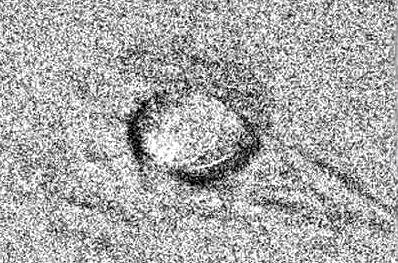 And now, half a century later, recently released Sharc2 sidescan sonar and Remote Operated Vehicle (ROV) images taken a year ago in August to September 2005, might help answer the question: What happened to the Kinross F-89 “swallowed up” on radar by a UFO? A couple of weeks ago I interviewed Adam Jimenez, Project Manager for the Great Lakes Dive Co. Adam received a Bachelor’s of Science Computer Engineering degree in 1990 from the Kettering Technical School in Michigan run by General Motors. He is also a Master Diver who has a Certificate with Rebreather Apparatus. He explained that in the year 2000, he and his colleagues formed their dive business to look for shipwrecks on the bottom of the deepest of the Great Lakes, which is Lake Superior. The original goal for Great Lakes Dive Company was not to salvage what they find, but to videotape discoveries for documentary productions. Originally in 2005, what the company was searching for were two Canadian-French minesweepers that sank off the Keweenaw Peninsula of Michigan. Problems arose with their sidescan radar, which had to be repaired. When it was ready to work again, it was too late to resume the minesweeper search, so they took a run at the last known coordinates of the Kinross F-89 that was also off Keweenaw Peninsula. Adam Jimenez, Project Manager, Great Lakes Dive Co., Brown City, Michigan: “We went out to the general vicinity of the last known radar contact. We began sweeping the area with out sonar array, which is an advanced system capable of searching a wide area. For people who don’t know a lot about sonar equipment, most sonar equipment is very narrow. You will search about a 1500-foot section of lake bed at a time and it takes a long time to “mow the lawn,” as they say, back and forth sweeping with sonar. Ours is a wide range sonar. It’s capable of looking over a wide area. It took us five or six days of sweeping until we got the hit on the F-89, or what appeared to be the F-89. We didn’t know until we looked at it a little closer. 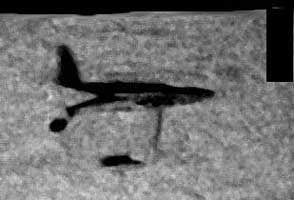 Sharc2 sidescan sonar low resolution (to maximize range) image of F-89c Scorpion lying on bottom of Lake Superior in Canadian territory. Wing missing. Black rectangle below plane is not part of scene, but is graphic blackout of GPS and depth data. Sonar image © 2006 by Great Lakes Dive Co.
United States Air Force F-89c Scorpion. There was a lot of emptiness down there. There weren’t any wrecks in the immediate area, so it’s a lot of plain, flat lake bottom. You get this shape that just sort of appears out of that. So the anomaly kind of stands right out to you. Several of us jumped up and said, ‘What is that? Back up!’ We went back. Did we say, ‘That’s the F-89!’ No, we didn’t know at that time until we were able to re-scan with the high resolution and take some measurements. SO, THEN YOU THINK IT’S PROBABLY THE F-89 FROM THE 1953 KINROSS INCIDENT. HOW DID YOU THEN FIND THAT OTHER MYSTERIOUS OBJECT? When we went back and got the high res image of the F-89, we immediately dropped the ROV in the water to look at the F-89 to hopefully get a serial number off the tail, which was exactly what we did. 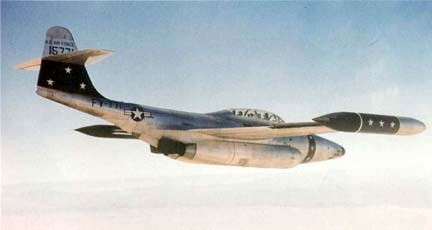 Also to get visual confirmation that it was the F-89 from other things like what type of wing pod does it have? What type of canopy have? Anything to give us a clue that this was an F-89 and not perhaps some other airplane. And what made us focus on the object when it began causing problems with our equipment. There’s a huge story there, not including the huge story about what happened leading up to 1953. WHAT WERE THE PROBLEMS WITH YOUR EQUIPMENT? We did not notice the (unknown) object at first until we began a detailed scan – what we call a high-resolution scan of the area – basically trying to find the wing and any other missing part we could find. There was one corner of the search grid that was sending back a distortion. It was only on that corner of the search grid. We could drag the sonar fish over the F-89 and get a good image – for a sonar image anyway – clear as a bell, which is what you see on our website (Sharc2 sidescan sonar low resolution image above.) But when we would drag the sonar fish over that particular location of the object, we would get a visual distortion in one of the corners of the search grid. When we began looking at the ‘mystery object,’ as we refer to it, we were trying to image the area in more detail to try to find parts of the F-89 that were not attached to the plane. Because of that visual distortion, we focused on that. It was kind of strange and we didn’t know if we were having a reoccurring problem with our sonar array. We would take the unit back to the F-89. It would not distort. We’d take the sonar unit back to the corner about 200 feet away, it would distort. Did F-89 Have Nuclear Weapon? So, one of the team members recalled that F-89s were equipped at one point with nuclear weapons. This prompted us to take everything out of the water and return to Michigan and obtain a Geiger counter. We were concerned we might be dealing with a radioactive source. We did that. We got hold of a handheld Geiger counter, put it inside the ROV to the bottom and the results were negative. There was no radiation coming from the object. ANY SPECULATION BY ALL OF YOU ABOUT THE INTERFERENCE? WHAT’S CAUSING THE INTERFERENCE? We thought radiation at first because it was almost a mimic of – if you’ve ever had a cellular phone turned on next to a computer monitor and get a phone call, you’ll see a distortion in the monitor. And that’s kind of what we were looking at in the images we were getting – that sort of visual distortion. So we thought we might be dealing with some form of radiation. But we eliminated radiation. We still don’t know. We haven’t been back since with the shark system – the big sonar array. We simply captured the images we captured on the cannibalized sonar system to get what we got. But it would be an interesting test to go back next season and use the shark array and find out exactly what is causing that distortion. IN THE SIDESCAN IMAGING, WHAT CAN YOU DESCRIBE IN MORE DETAIL ABOUT THE TEARDROP-SHAPED OBJECT? It’s 212 feet away, actually. You really can’t tell by the sidescans. The ROV footage is much more telling. What can I tell you about it? We don’t know what it is. We’re not UFOlogists. We are divers and scientists. The ROV footage shows that it is clearly metallic. It doesn’t show up on a regular magnetometer scan, which does not necessarily mean anything except it’s not made out of iron. Unidentified teardrop-shaped object 212 feet from F-89 with triangle-shaped slide mark to the lower right. Image by remote operated vehicle (ROV). Images © 2005 by Great Lakes Dive Co. It definitely has the reflective qualities of metal. That’s why we call it metallic. There has been some speculation on the internet that it’s dented in the front. In fact, it is not dented in the front. That appears to be a distortion on the sidescan imagery. So, it’s very smooth and metallic in shape and fairly large. COULD YOU PLEASE GIVE SOME OF THE MEASUREMENTS YOU KNOW – THE DISTANCE BETWEEN THE PLANE AND THE TEARDROP-SHAPED OBJECT AND THE ESTIMATED SIZE OF THE TEARDROP-SHAPED OBJECT? The distance between the two objects is approximately 212 feet. I believe the size of the teardrop is roughly, I think it is 8 feet by 15 feet. But that’s just the exposed portion. We don’t know what else lies beneath the sand. SO RIGHT NOW YOU’RE SAYING, FROM YOUR BEST EDUCATION, THAT THE TEARDROP ITSELF IS NOT MORE THAN FIFTEEN FEET IN DIAMETER? It’s not diameter, because it’s oblong kind of shape. So, from what we can tell that’s exposed, it’s about a fifteen by eight feet section. BUT NOT LONGER THAN FIFTEEN FEET? Exposed, right. Now, who knows what else is underneath? What you’re seeing in the sidescan from the tail to the tip is about fifteen feet. From the absolute widest point of the teardrop across is, I believe, 8 to 10 feet, somewhere in there. ARE THERE ANY INSTRUMENTS YOU CAN USE THAT CAN SAY WHAT THIS IS MADE OUT OF? No. It does not show up on a magnetometer and that’s pretty much what you can use without actually getting into recovering the object. BUT IF IT DOES NOT HAVE IRON, IT IS NOT GOING TO HAVE A SIGNATURE IN A MAGNETOMETER? Right. Magnetometers are essentially huge magnets. Anyone who has had a magnet knows that sometimes they attract metal and sometimes they don’t. This one (unknown circular object) does not give a reading on the magnetometer. 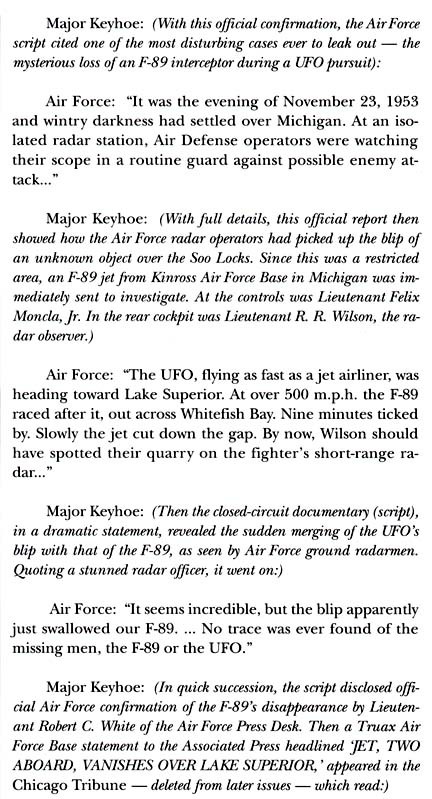 IN THE ORIGINAL STORY THAT WAS RELEASED FROM THE AIR FORCE AND MEDIA AT THE TIME (IN 1953), THE AIR FORCE SAID THAT THERE WAS AN OBJECT IDENTIFIED AS A UFO TRAVELING OVER 500 MPH, THAT THE F-89 WAS RACING TOWARD OUT ACROSS WHITE FISH BAY. 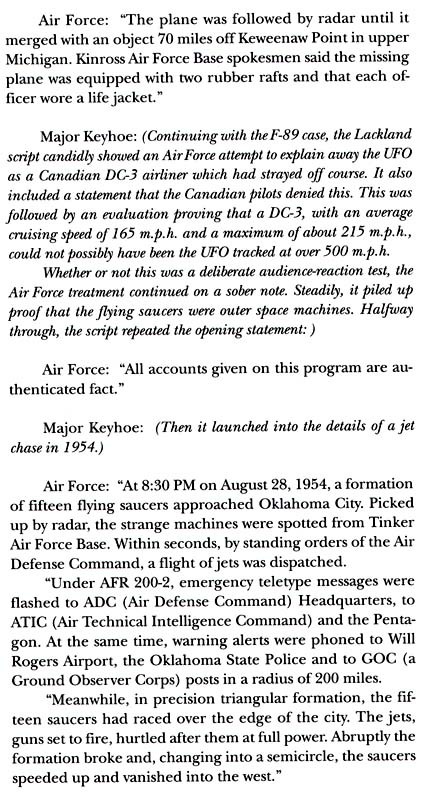 AND THAT THEY WATCHED ON RADAR APPARENTLY AS THE BLIPS BETWEEN THE F-89 AND THE UFO THAT WAS TRAVELING RAPIDLY CAME TOGETHER AND JOINED INTO ONE BLIP. ONE OF THE QUOTES FROM THAT PERIOD OF TIME WAS FROM THE AIR FORCE: ‘The blip apparently just swallowed the F-89. No trace was ever found of the missing men, F-89 or the UFO.’ THAT’S A QUOTE FROM A REPORT. SO YOU WOULD THINK THAT WHATEVER THIS OBJECT WAS, THE BLIP THAT SEEMED TO SWALLOW THE F-89, IT WOULD HAVE TO BE BIGGER THAN AN F-89? Yeah. The airplane disappeared at 7,000 feet also. The aircraft we found does not appear to have hit the lake from a fall of 7,000 feet. The wreckage we found would certainly not suggest that the plane fell from an altitude of 7,000 feet. SO THERE REALLY IS A SUBSTANTIAL MYSTERY ABOUT WHAT THE TEARDROP-SHAPED OBJECT IS DOWN THERE A FEW HUNDRED FEET FROM THE F-89? What IS the Mystery Object? The Great Lakes Dive Co. would simply have sent the GPS coordinates of the aircraft to the U. S. Air Force so they could retrieve their airmen, if it had not been for the object. Certainly, that’s what we would do with the minesweepers once they are located. We would supply the coordinates to the appropriate agencies who might want to recover their officers. But the object changed everything, so it kind of puts us in a holding pattern with everything. MEANING THAT YOU WOULD LIKE TO HAVE A CLOSER IDENTIFICATION PERHAPS OF WHAT THE OBJECT IS? YOU WOULD DO THAT IN 2007 IN WHAT WAY? We would take the ROV back down. Again, we looked at most of the site. We’d like to look a little bit further. We were hampered by worsening weather in the middle of the lake. So we weren’t really able to finish what we would like to finish. And there’s been some suggestion by the team to utilize what they call a high-pressure wash system on the ROV, which basically generates a stream of water capable of dusting the silt off things. Possibly taking a run at the unknown object with that system. We don’t know. We’re still working out the logistics. IF YOU COULD THEN SPRAY OFF SOME OF THE COATING OF THE MUD AND SILT, YOU MIGHT BE ABLE TO SEE MORE CLEARLY WHAT THAT OBJECT IS. YOU WOULD DO THIS VIDEOTAPING AS YOU WENT? Absolutely. Well, as much as we could. Whenever you use a high-pressure wash system, it tends to stir up silt quite a bit. So, there might be waiting and seeing afterward. Any Military Interest in the Lake Superior Discoveries? HAVE YOU HAD ANY CONTACT FROM ANY MILITARY AGENCY TO DATE ABOUT THIS? No. No military agencies. The only contacts we’ve had are routine contacts with the Canadian government regarding permits to the site, which is not sinister in the slightest. It’s routine. The Canadian government believes anything on the lake bottom is their property – especially something that has not been reported as being discovered. They like to know what the location is before they issue a permit to return. We have other projects in the works, which forces us to keep a delicate peace with the Minister of Culture in Canada so that nothing else gets disrupted. SO CURRENTLY WHERE THE F-89 AND THE ROUND OBJECT LAY IS IN CANADIAN TERRITORY? IF THIS ROUND OBJECT TURNS OUT TO FALL INTO THE CATEGORY OF A SILVER DISC AS WAS PHOTOGRAPHED SO MANY TIMES IN THE 1940S, 1950S, THE 1960S – WHAT DO YOU THINK WOULD BE THE NEXT STEP AS FAR AS YOU BEING ABLE TO DO SOMETHING ABOUT RETRIEVING IT? OR WORKING WITH THE CANADIAN GOVERNMENT? AND WHAT PERHAPS WOULD THE U. S. GOVERNMENT SAY? I think the U. S. government – unless they can show that the object is their property – would have much of a say about the (unknown) object itself. Of course, the F-89 remains the U. S. Air Force property, which is fully understandable. But the Canadian government is very restrictive. They consider everything on the lake bottom, be it a shipwreck, plane or something else unknown, their property automatically. So, any kind of recovery effort that’s done legally would have to be done through the Canadian government, unless the U.S. government could prove the (unknown) object is their property, which I have no idea. They might say it’s a piece of their military hardware. Maybe they know something we don’t. THE SIZE IS PUZZLING, BUT IF IT IS CURRENTLY THAT THE PART WE ARE SEEING IS ONLY AN UPPER PORTION OF SOMETEHING THAT MIGHT BE BIGGER UNDERNEATH, THAT COULD BE A WHOLE OTHER STORY? Certainly. The speculation can run the spectrum from one end to the other of what it is and how big it is. One of our team suggested perhaps it is upside down. Perhaps we are seeing the bottom of whatever that is. It’s possible it’s a piece of something. The rest of it could be somewhere else. We just don’t know. It’s wide open for rampant speculation at this point without further analysis. Mid-Air Collision? Or Advanced Technology That “Placed” F-89 On Bottom of Lake Superior? ABOUT THE ISSUE OF THE F-89 NOT LOOKING LIKE IT HAD FALLEN FROM 7,000 FEET, IT REMINDS ME OF THE FAMOUS MANTELL CASE OVER KENTUCKY IN WHICH THEY FOUND THAT PLANE BROKEN UP WITH THOUSANDS OF LITTLE HOLES IN IT. AGAIN, I BELIEVE ONE OF THE STATEMNTS WAS THAT IT DIDN’T LOOK LIKE IT CRASHED. IT LOOKED LIKE IT HAD BEEN PLACED AND CRACKED APART. THIS RAISES THE QUESETION ABOUT THE INTERACTION WITH THE UFO ACTIVITY – THERE ARE ALLEGEDLY BEAMS OR ELECTROMAGNETIC FIELDS THAT MIGHT PLACE A PLANE DOWN IN THE BOTTOM OF WATER WITHOUT THE PLANE ACTUALLY FALLING. Anything is possible at this point, Linda. If I had to guess, I’d say the plane experienced a low level collision with the object that’s near it. Maybe the altitude was being reported by the pilot and maybe unbeknownst to him, he was a lot closer to the lake than he thought. The forensics of the aircraft suggest that it was a low level speed collision with something. There does appear to be what we refer to as a ‘strike mark’ on the (unknown) object that does match the hole where the wing used to be on the F-89. There’s an oblong kind of unique shape where the wing used to be. There’s a – I don’t know if you would call it a scratch per se. It’s definitely not a dent. But there is a matching formation on the object that matches the hole where the wing was (on the F-89). So, if I had to guess, my best guess would be that a low level collision took place and both objects went to the bottom (of Lake Superior). WHEN YOU TALK ABOUT THAT SCRATCH, YOU MEAN THAT THERE IS A SCRATCH ON THE ROUND, OR TEARDROP-SHAPED OBJECT? Right. I call it a strike mark. I don’t know if you could call it a scratch. It does not appear to be an indentation of any kind in the metal. It’s just an oblong mark, if you will, that does match the oddball oblong mark on the F-89. If you can imagine a wing being ripped off from an airplane, it’s going to leave a very distinguished hole. It’s not going to be a simple laser cut, precision line. It’s going to leave a strange shape because of twisted metal. Well, this shape does appear to match with the mark on the object. YOU WOULD SPECULATE THEN WHAT HAPPENED? From those two things, the strike mark (on unknown object) and the hole in the F-89, I would speculate that the F-89 did collide with this object in some manner. AND BOTH WENT DOWN TO THE BOTTOM OF LAKE SUPERIOR? That would be our guess, yes. Now, that’s assuming this (unknown round object) isn’t just a piece of something, but it would appear that both things went to the bottom in their entirety. There doesn’t appear to be a broken off piece of something. But again, we don’t know. We don’t know how much is below the surface. THAT WING FROM THE F-89 MIGHT STILL BE THERE UNDER THE BOTTOM MUD, OR IT MIGHT BE UNDER THAT OBJECT? It’s a possibility. There are several theories about what might have happened to the wing and that is certainly one of them – that it could be under the object itself. Or nearby and just buried under mud we can’t see. We’re not sure. IF IT REALLY IS A SILVER DISC IN THE UFO CATEGORY, WHAT DO YOU THINK HAPPENS NEXT? The entire script is reprinted in Glimpses of Other Realities, Vol. II: High Strangeness © 1998 by Linda Moulton Howe. Please see Earthfiles Shop. 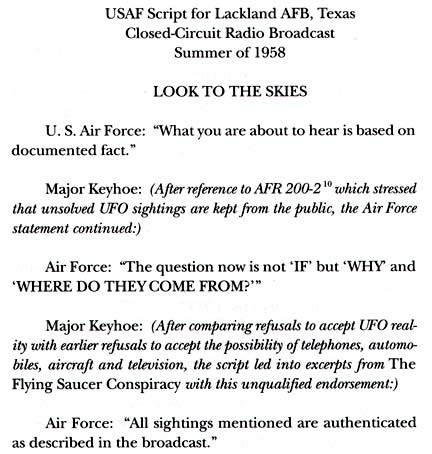 For further information about American military interaction with UFOs, please see reports below in the Earthfiles Archives and my book Glimpses of Other Realities, Vol. II: High Strangeness in the Earthfiles Shop. 12/07/2005 — Zeta Reticuli I and II – Binary Home of Extraterrestrial Biological Entities? 02/07/2005 — FINAL Part 3: UFO Crash/Retrievals: Status Report V – Is The Cover-Up Lid Lifting? 02/04/2005 — Part 2: UFO Crash/Retrievals: Status Report V – Is The Cover-Up Lid Lifting? 01/30/2005 — Part 1: UFO Crash/Retrievals: Status Report V – Is The Cover-Up Lid Lifting? 12/10/2004 — Part 4: “Peculiar Phenomena,” V-2 Rockets – and UFOB Retaliation? 12/10/2004 — Part 3: “Peculiar Phenomena,” V-2 Rockets – and UFOB Retaliation? 11/12/2004 — Strange Metal Pieces from Plains of San Agustin Alleged UFO Crash Site Analyzed.